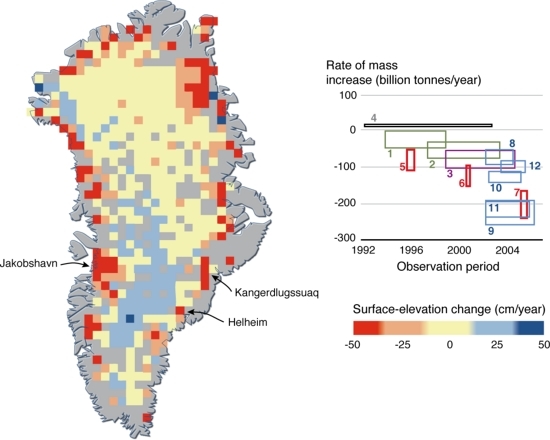 Mass-balance estimates for Greenland show thickening at high elevations since the early 1990s at rates that increased to about 4 cm per year after 2000, consistent with expectations of increasing snowfall in a warming climate. However, this mass gain is far exceeded by losses associated with large increases in thinning of the ice sheet near the coast. Total loss from the ice sheet more than doubled, from a few tens of billions of tonnes per year in the early 1990s, to about 100 billion tonnes per year after 2000, with perhaps a further doubling by 2005. These rapidly increasing losses result partly from more melting during warmer summers, and partly from increased discharge of ice from outlet glaciers into the ocean. In particular, the speeds of three of Greenland’s fastest glaciers approximately doubled since 2000, although two of them have partially slowed since. The analysis has been derived by comparing satellite and aircraft laser-altimeter surveys. 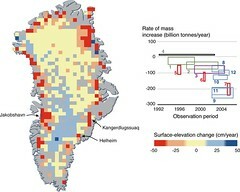 The graph shows rates at which the ice-sheet mass was estimated to be changing based on satellite radar-altimeter surveys (black), airborne laser-altimeter surveys (green), airborne/satellite laser-altimeter surveys (purple), mass-budget calculations (red), temporal changes in gravity (blue). Rectangles depict the time periods of observations (horizontal) and the upper and lower estimates of mass balance (vertical). Jakobshavn, Helheim, and Kangerdlugssuaq are fast glaciers that doubled in speed recently.